CHPS level has been extensively evaluated and “simplified” registers have been designed that allow for centralizing the recording of health data in a significantly reduced number of books. 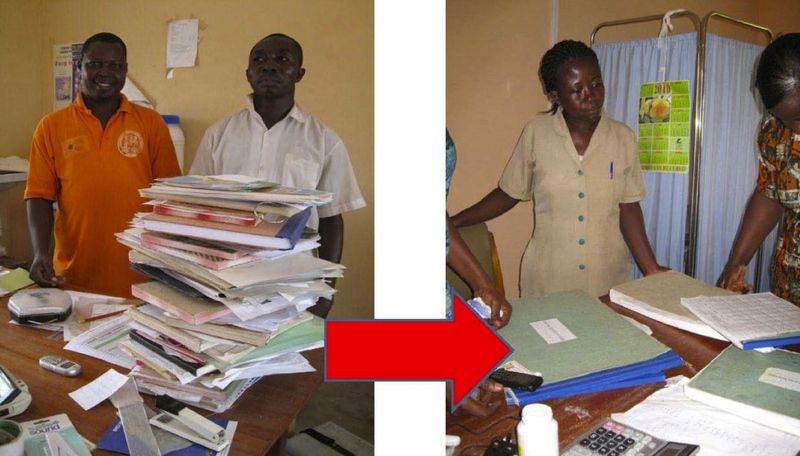 The simplified registers sort and organize health information, easing the reporting process required by community health workers each month. The simplified registers also streamline the data recording process in order to facilitate subsequent data capture through mobile phones. Mobile-phone based health information system for health workers: MoTeCH uses a low-cost GSM mobile phone technology to capture, transmit and store health data collected by community health workers during patient encounters. The system uses SMS (short messaging system) as a transport mechanism to transfer health data from the point of encounter to a central patient database. With this information, the system sends community health workers messages that alert their attention to clients in their catchment area that are due for essential care. In turn, community health workers’ outreach work is made more effective, targeting clients that need specific health services. In addition, data capture via mobile phones will eventually automate the production of monthly reports, which currently require several days to compile. Mobile-phone health education: MoTeCH includes a health education component that provides expectant and new parents with key health information related to pregnancy, safe delivery, and the proper growth and development of their newborns and infants. The information is tailored to the specific week in a woman’s pregnancy or the specific age of the infant child. Subscription to MoTeCH’s health education through the ‘Mobile Midwife’ program is open to the whole community. Targeting the whole society ensures that friends and relatives may influence expectant and new parents positively, resulting in a healthy pregnancy and delivery. Additionally, pregnant and new parents receive reminders when the pregnant woman or the infant child are in need of routine health services, such as antenatal care or immunizations. This enables for the system to further enhance the quality and frequency of patient-provider interaction. The data visualization tools: Data visualization software is under development that will organize health information collected by community health workers into easy-to-understand charts, graphs, and maps. These tools will portray the work of community health workers for their own benefit, illustrating where they are reaching their expected milestones and where they may be falling short. In addition, data visualization tools will utilize the information captured by the mobile phones to make the work of individuals supervising the CHPS level of healthcare delivery more focused and evidence-based.